You're probably wondering how my herb gardening is coming along. 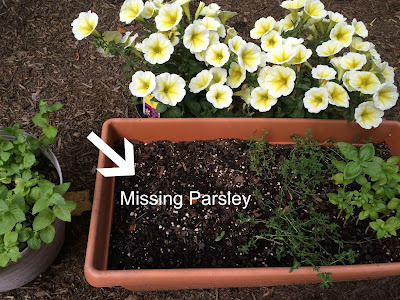 The morning after I blogged about my new hobby: herb gardening, my entire parsley plant was gone. Literally gone. The entire plant. I'm pretty sure a rabbit ate it. Despite this setback, I'm still really invested in my outdoor plants. I've taken time this summer to tend to my flowers. It's been a learning process, but I can tell I'm getting better. We planted our Peace Lily too early in April and we almost lost it due to several nights below freezing. Luckily, I've managed to keep it alive! I never thought I'd be interested in horticulture....(LOL at "horticulture")....but I'm always surprising myself. I love to see the progress I'm making when my plants are doing well. Brian is all too familiar with my previous failures in the horticulture department, so he is not yet convinced of my transformation in this area. I recently proposed the idea of building a raised garden bed in our yard, and his response was an immediate "no." Also, last week, he bought a container of succulents for our kitchen. He said he got it for me because it "Thrives On Neglect."